« Daring Bakers Challenge January 2012: Back to Basics – Scones! 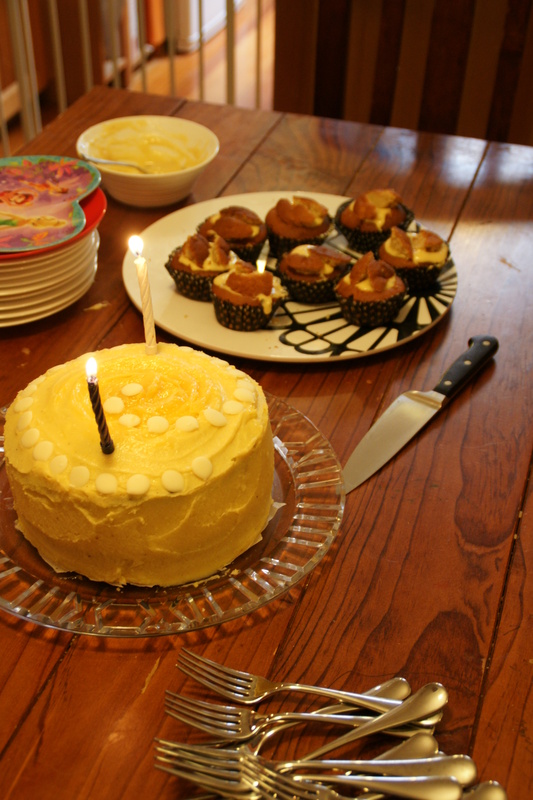 Regular readers of this blog (waves to my husband) will recall “the Wombat Cake Incident“, in which the harsh Australian sun took a cruel, cruel toll on my little big boy’s 1st birthday cake. This year I took preventative measures and made the icing (in the thermomix) using both copha and butter. I also used the thermomix to make the cake, using the basic cake recipe from Dani Valent’s book In the Mix. It seemed to do the trick, in that the icing didn’t melt into a big puddle. It was also nice and easy to spread at midnight, which is when I always seem to be finishing off birthday cakes! The little big boy is obsessed with cars and trains, so he got a train. The cake itself was overcooked so a bit dry but I’m hoping the small people won’t hold it against me. As well as the train cake, we also had this fantastic “tie-dyed” cake, made by my friend Bernadette and her husband and niece. The cake itself was a devil’s food cake and was Miss B’s cake of choice (traitor!). Better photos of the cake can be found on Bernie’s blog. And finally, here is a cake I made for the husband’s birthday in December. 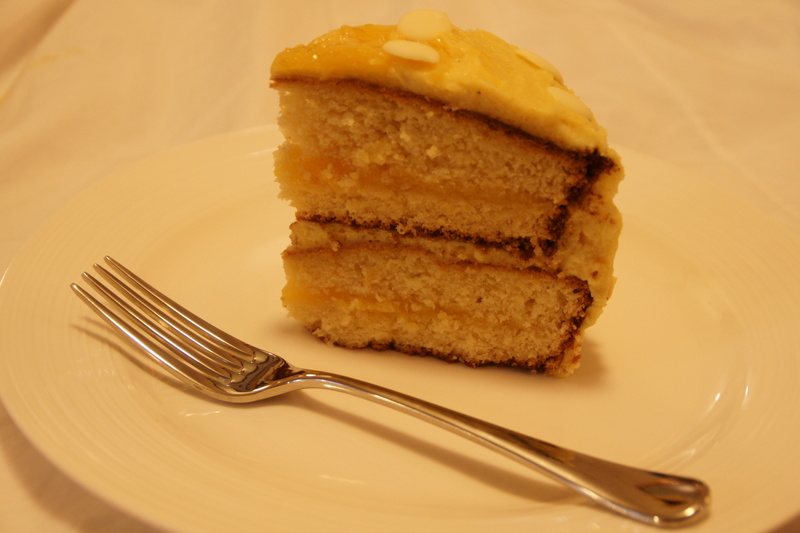 It is a lemon luxury layer cake from Rose Levy Berenabaum’s book Heavenly Cakes. It used about 18 eggs and 3 blocks of butter. I don’t even think I am exaggerating. There was lemon curd, a white chocolate custard, a buttercream and the cake itself. It was delicious, but quite a commitment! 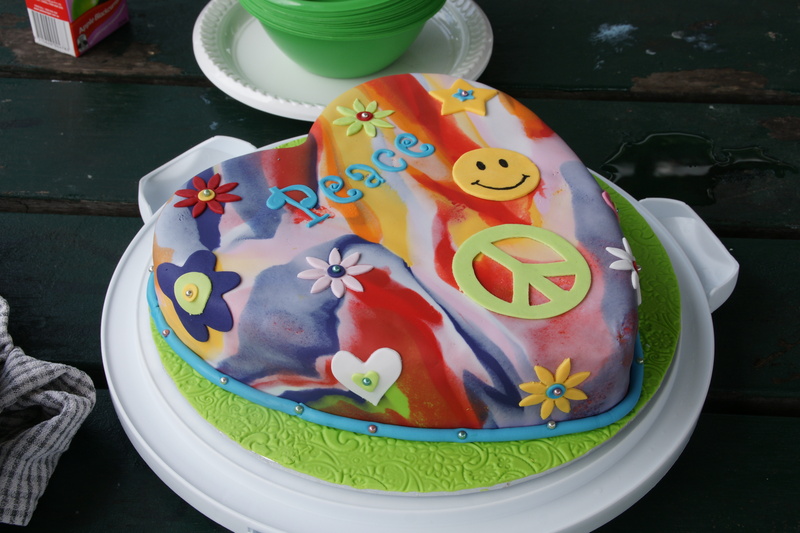 Here is the inside of the cake. The layers are meant to be even but I am rubbish at cutting even layers. More practice needed! Gorgeous cakes! Love the swirly candy wheels on the train 🙂 Didn’t realise you had invested in a Thermomix. When did you get it? Is it proving to be worth the price? Yes, I got one about a year ago, I’ve just been too embarrassed by its indulgent nature to mention it! I like it very much, but the price is obviously the major issue. I feel like it could and should be amazing, but that I don’t make the best use of it. I tend to mostly use it as a food processor, which is great, but really a good food processor could do the trick. The amazing things it can make seem to be things that the children won’t eat, sadly! It’s been great for things like soup, bread, peanut butter, stock paste and pizza dough though. I feel like I should lend it to you so you can help it fulfil it’s potential! I have been meaning to ask about Tony’s birthday cake. I have reviewed the recipe a few times but it looks very time consuming, good for you. 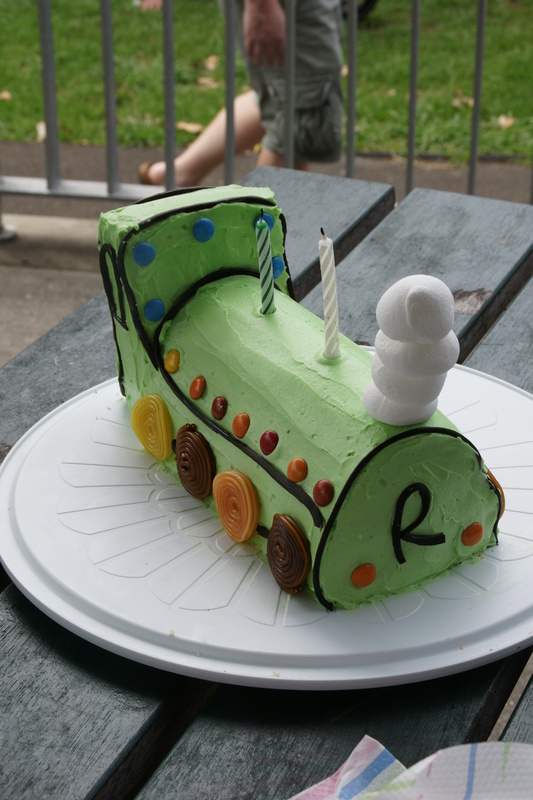 I really loved Mr R’s cake, particularly the “steam”.